Momentum continues to build behind the campaign to bring a $15 minimum wage to voters in Minneapolis. In the first week of signature collection to get $15 on the November ballot, 15 Now and other supporting organizations engaged over 100 volunteers, who gathered more than 4,000 signatures. 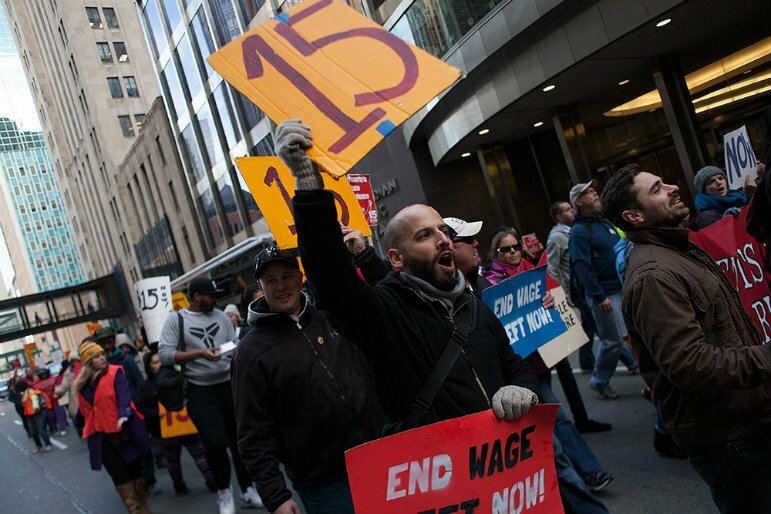 The speed and success in its first week of petition gathering and fundraising, combined with victories for $15 across the country, shows Minneapolis is ready for $15 per hour. Support for $15 has been growing for months. On Super Tuesday, 15 Now volunteers passed resolutions in every Minneapolis ward supporting the $15 ballot initiative, and in 100 precincts across the Twin Cities. Bernie Sanders decisively won at the Minneapolis caucuses, by 65 percent or more in some precincts, calling for a $15 minimum wage. Workers have gone on strike numerous times demanding $15 per hour, alongside a package of workers’ rights reforms. A poll released last fall conducted by the Feldman Group showed 82% of likely Minneapolis voters supported $15 per hour phased in over time. The charter amendment proposes big business raise wages to $15 over 3.75 years, with an extended phase-up over 5.75 years to $15 for small-medium sized businesses. The first step for all workers (to $10 per hour) would start on August 1, 2017. A growing list of community organizations and unions are backing this proposal as the correct initiative for Minneapolis. “Mayor Betsy Hodges and the City Council have had two years to address Minneapolis’ worst-in-the-nation racial and economic inequalities. We need to take our own initiative to get fair wages for local workers,” said Nekima Levy-Pounds, the President of the Minneapolis NAACP. Volunteers are confident they’ll be able to gather 20,000 signatures or more before the July deadline. “CEO salaries are at an all-time high while wages for working people have stagnated. All workers need at least $15. No workers, whether they live in Minneapolis or Seattle, can put off paying the rent or putting food on the table. We don’t want to give big business any space to say it can’t be done in Minneapolis,” said Kip Hedges, organizer from 15 Now. On Friday, May 6, the Bryant Neighborhood Association and the Central Area Neighborhood Development Association are sponsoring a rally and concert to raise awareness of the grassroots campaign for the $15 ballot initiative. 15 Now is teaming up with supporters of the Vote 15 campaign, and speakers include Nekima Levy-Pounds of the NAACP and worker leaders in the Fight for $15. Music from Greg Grease, Mike Queen, DJ Just 9 and Me’Lea. Council members Alondra Cano, Cam Gordon and Elizabeth Glidden will be in attendance. This rally will take place at Sabathani Community Center, 30 East 38th St. Minneapolis at 5:00 p.m., Friday, May 6. They will think people are chumps for allowing it to start at $10 per hour with an oh-so-gradual phase-in. Carceral Colonialism: Imprisonment in Tribal country As The Circle reports this week, the Minnesota incarceration rates for American Indians are higher than any other ethnic group in the state. The U.S. incarcerates more of its citizens than any other country in the world.